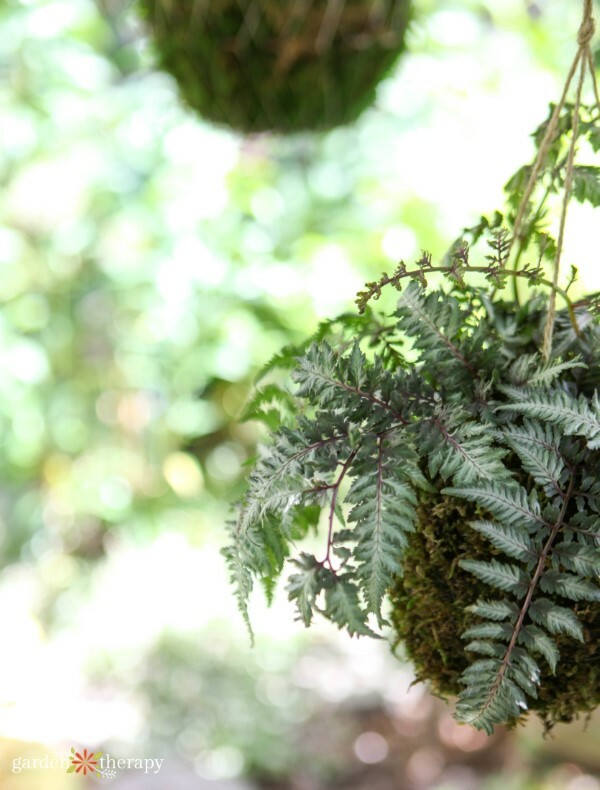 Indoor ferns are often used to create kokedama which can either be set on a table for display or hung from the ceiling. But why not move the project outdoors and create a floating forest? 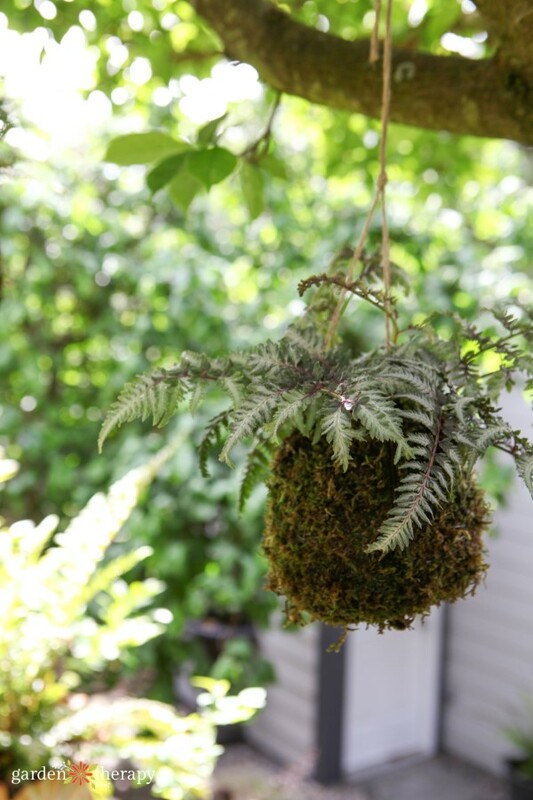 Ferns are common plants planted beneath trees, and raising them up into hanging planters and kokedama moss balls makes an unexpected and intriguing garden display. 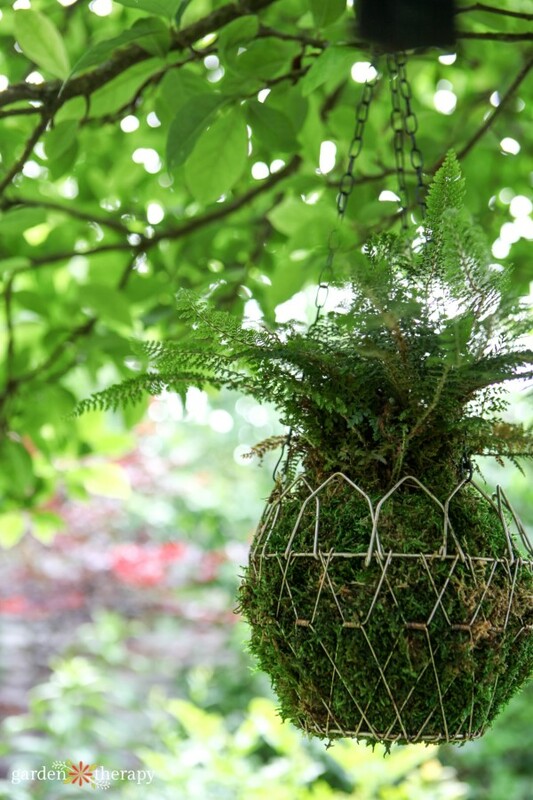 Kokedama is the Japanese art of wrapping plant roots in soil and moss. “Kokedama” translates to “moss ball” and it is a modern blend of traditional Japanese bonsai and kusamono planting techniques. You may have heard the word thrown around and used in different ways, which can be confusing because “kokedama” is used as both a noun and a verb and is both singular and plural, as in “I made one kokedama” or “I made too many kokedama to count” (which you just might after you see how much fun it is!). I have a beautiful big magnolia tree that offers the ideal space for a floating forest. 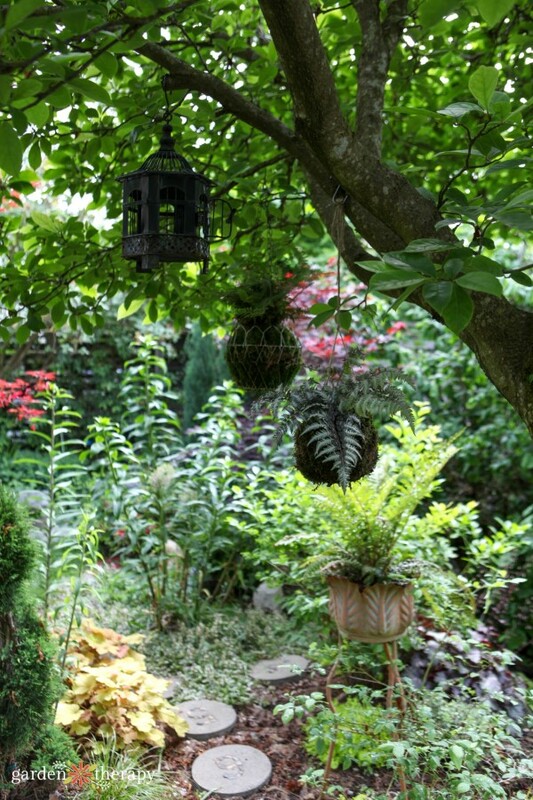 A floating forest can be created by hanging a collection of plants from the tree branches to decorate below the canopy. As you can imagine, under the canopy there’s quite a bit of shade so it’s important to choose plants that tolerate and thrive in the shade. Ferns are a wonderful choice. And there are so many beautiful varieties that often go overlooked. This post is sponsored by Monrovia who also provided me with a number of ferns to try out for this project. After testing a few sizes and designs, I ended up choosing the stunning Regal Red Japanese Painted Fern as the feature plant for my floating forest. Don’t miss the giveaway at the end of this post for your chance to win a Monrovia gift card! Dwarf Asparagus Fern – a bright yellow-green fern with fine, needle-like foliage and a compact growing habit. Thirves in zones 9-11. Lemon Button Fern– this tiny member of the Boston fern family only grows to a foot at its tallest. When crushed, the foliage fives off a pleasant lemony scent. Thrives in zones 10-11. Tatting Fern – this dwarf fern grows slender, delicate fronds and small ball-shaped structures along its midribs, giving it a ton of visual interest. Thrives in zones 4-8. Pewter Lace Painted Fern – This fern’s lacy foliage is a light silvery color at the edges and deepens into a dark blue towards the center of the plant. Thrives in zones 5-8. Virginia Blue Rabbit’s Foot Fern – dramatic silvery blue leaves and fuzzy orange rhizomes give this fern a ton of dramatic visual appeal. Thrives in zones 8-9. 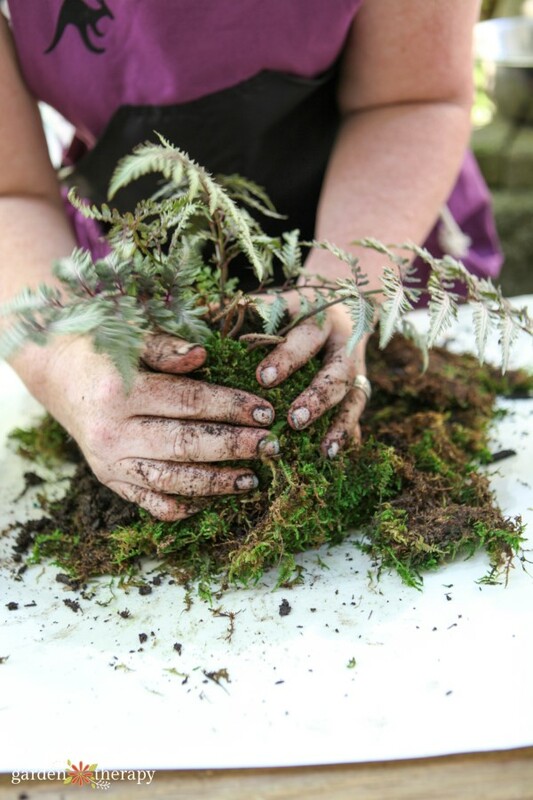 I suggest getting a friend to help when you’re working with a large root ball like a fern because you’re going to need more than just your own two hands. I roped a friend into helping me when she came over for a garden tour and it turned out beautifully! 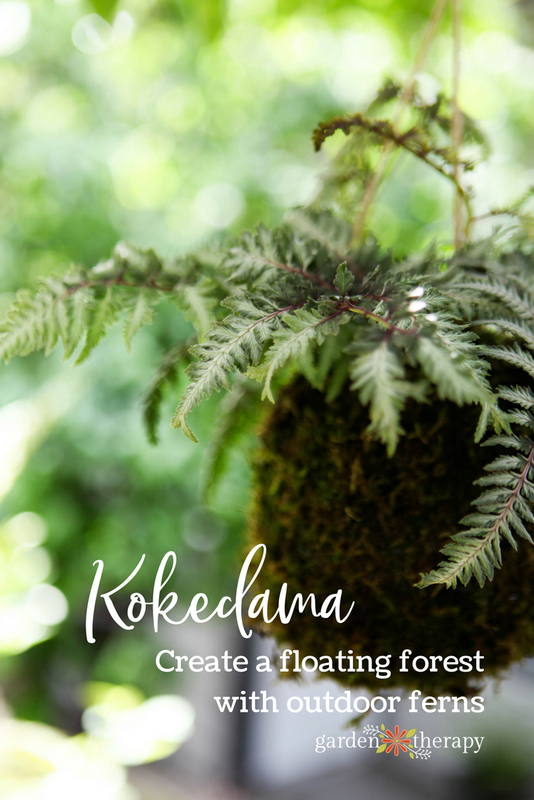 Note: be gentle with the fern leaves when making kokedama. It’s a very hands-on DIY and fern leaves can snap easily. 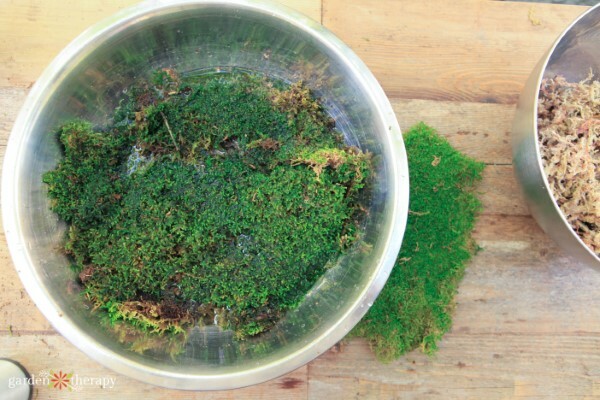 Start by soaking the preserved sheet moss in a bowl of warm water. I like to use preserved sheet moss because it holds its green color the longer than Sphagnum moss (which isn’t green) or basket moss (which is green for a very short time). 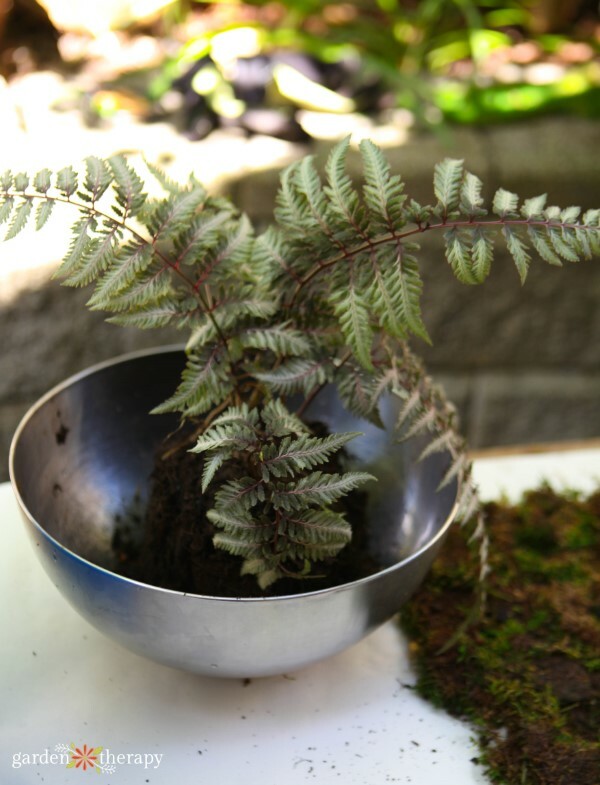 Prepare the fern by removing it from its pot and shaking off much of the soil from the roots. You can also soak the roots in water to loosen the soil. Squeeze the water out of the moss. 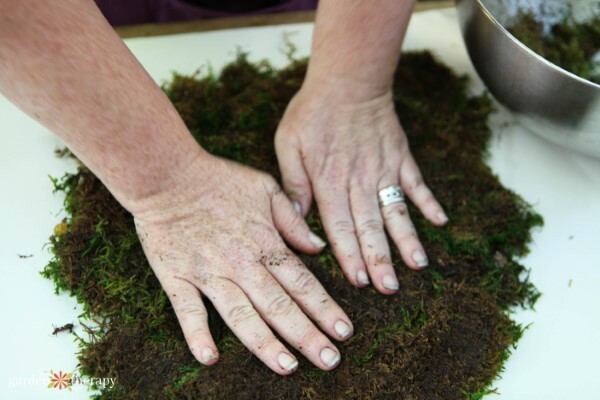 Lay out the moss green-side down in a circle 3-4 times larger than your soil ball will be. Mix Bonsai soil and Peat moss in a 1:1 ratio in a bucket. 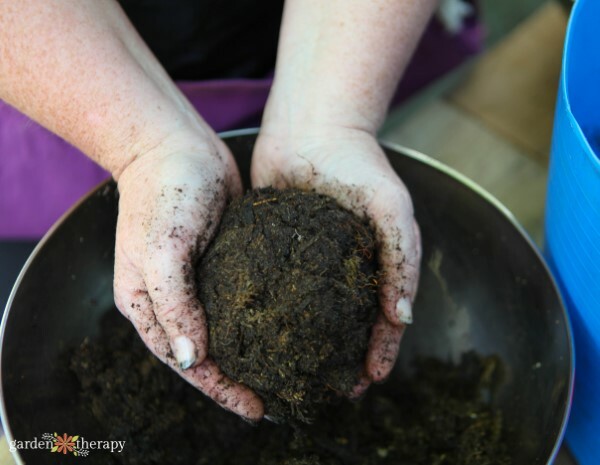 Add water to moisten the mix enough so that it holds together when you form a ball with your hands.Create a soil ball with your hands that will be the final size of the root ball. Gently break the ball in half and reform it around the roots of the fern. 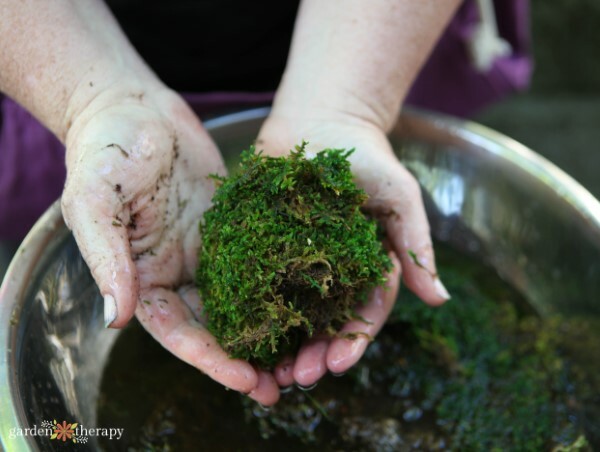 Set the root ball in the middle of the moss circle and lift and shape the moss around the soil. This is where a friend’s extra hands come in handy! 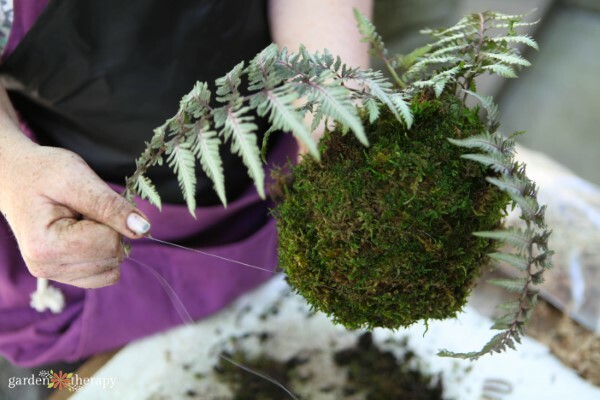 Use clear fishing line to wrap the moss and hold the ball together. 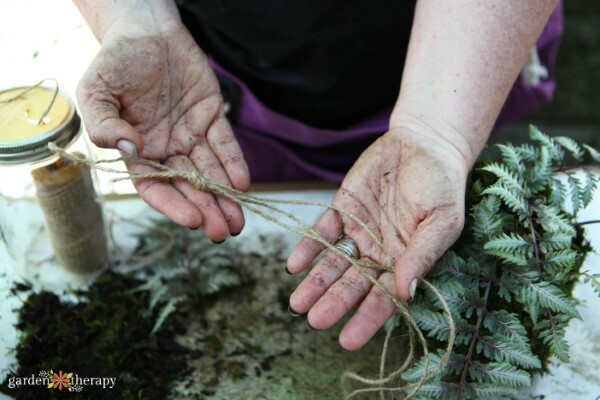 You could alternatively use jute garden twine if you would like to see the twine over the moss. And this is another reason that it is helpful to have a friend come over to help. I was about to hang the fern by tying jute twine to the fishing line but my brilliant pal came up with a better idea! Create a hanger by tying three lengths of jute twine in a knot and setting the moss ball on the knot, with the three strings coming up and over the ball. Tie them together at the top and hang the ball from a tree. I created a second kokedama with a Tassel Fern and set it in a vintage egg collecting basket to hang. I love how this one turned out as well. 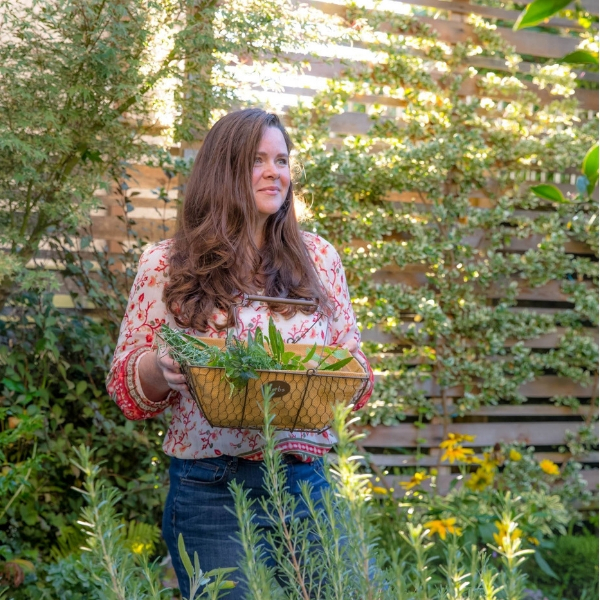 Ferns like to stay moist, so regular watering is the key to longevity. 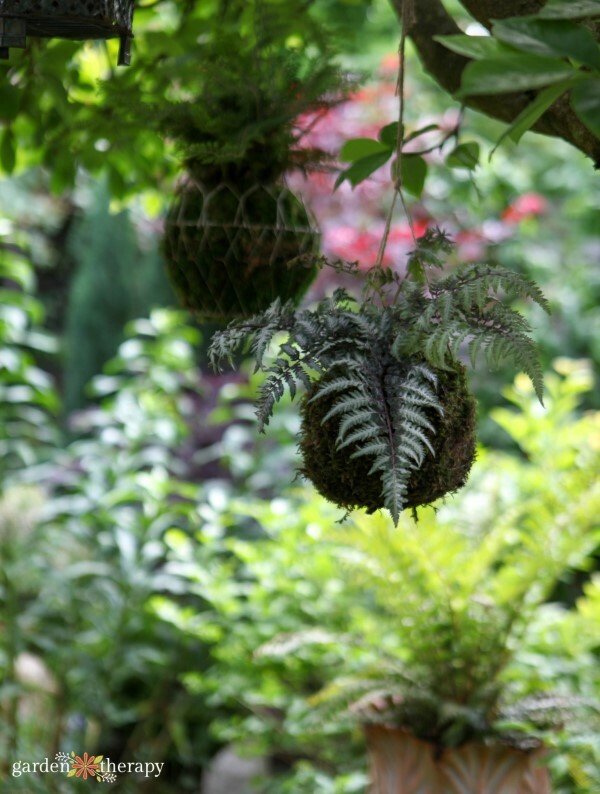 Water kokedama in a bowl or bucket of rainwater for 10 minutes, then hang it back in place to drain and grow. I like to keep a bucket out in the garden at all times, so I can just pop the ball into the bucket when I’m out enjoying the garden. Just be sure to set a timer so you don’t get distracted and forget to take it out. I’m very easily distracted in the garden so the timer trick helps me tremendously! 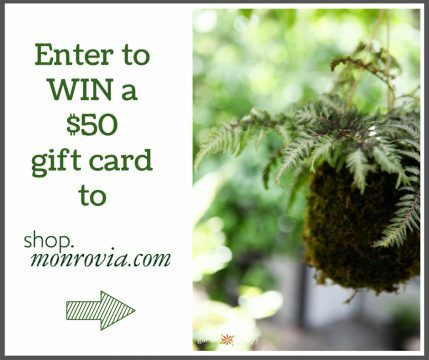 Monrovia has generously offered to give away a $50 gift card to one lucky Garden Therapy reader. 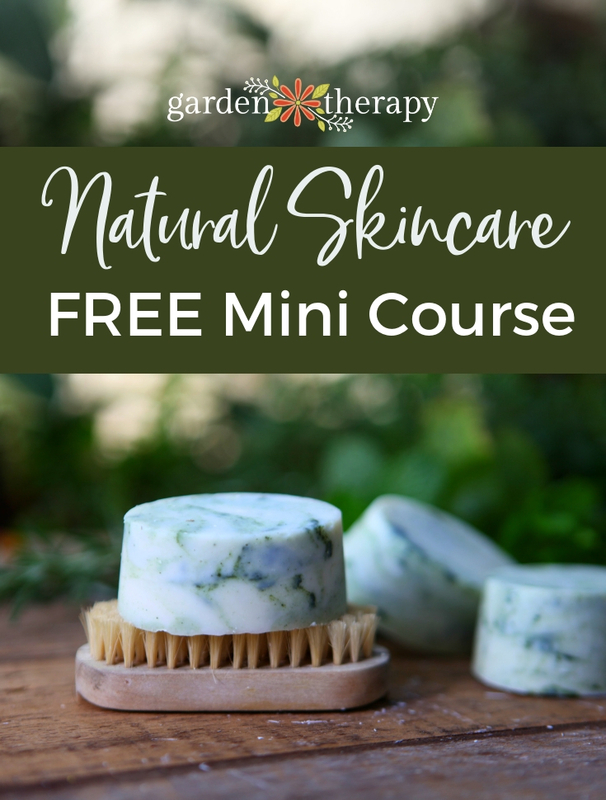 To enter, simply leave a comment on this post by June 24, 2018. Be sure you are also signed up for our newsletter to get news and special offers we don’t share anywhere else. This contest is open to residents of the continental US and Canada, except Quebec and where prohibited. I would love to try and cover the ball with Succulents. Would it hold more than one plant? I live right next to a mountain and we have so many ferns that I never know what to do with them. Ferns are very tranquil, but they can also make you seem a little bit lazy. But this, this will make them seem a little more exotic. So excited to try this, that and the fact that it won’t be too expensive.